If like myself you don't have a bath tub of your own, then most likely you become most excited about the newest shower gel launches. Even if I did have a bath tub I'm sure my excitement wouldn't wane as who has time for a full, relaxing bath each morning? Not me that is for sure. 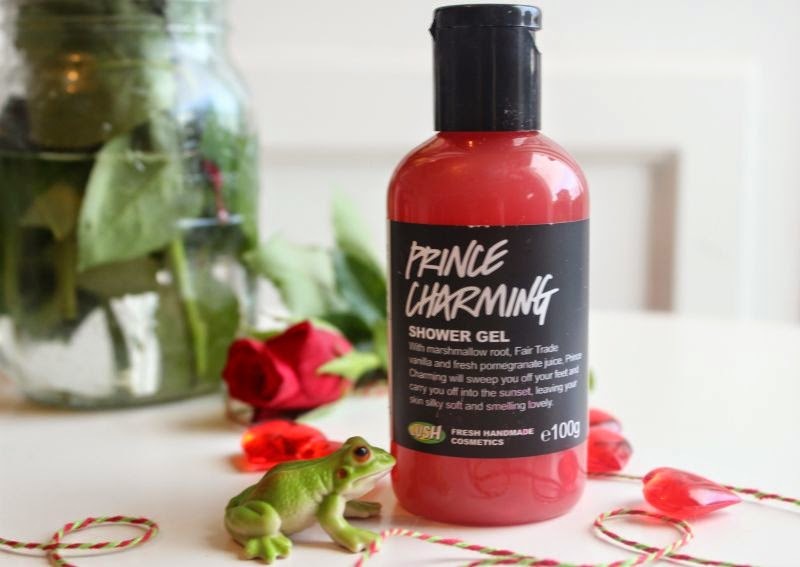 The newest and sadly limited edition shower launch from Lush is Lush Prince Charming Shower Gel. This is the first edition of Lush Prince Charming Shower Gel in which I have enjoyed the scent. This time around it is less fruity based (I'm almost certain that previous editions were passion fruit based which is less than a favourite of mine) and more candy/vanilla in fragrance. If you like fluffy, sweet, vanilla and/or marshmallow scents then I have a sneaky feeling you will enjoy this. A few have asked me if this is at all similar to Lush Snow Fairy Shower Gel and I wouldn't say so - this has a more creamy, vanilla based note where as Snow Fairy was sharper and more fruity based. Perhaps the best way to think of it as a more mellow vanilla scent but both are fairly sweet and dare I say it "cute". As with all Lush shower gels this is gentle yet effectively cleanses my skin without stripping or drying out my skin, it is not the most moisturising of formulas so you may find that you do still require a body moisturiser after use. You can also Lush Prince Charming Shower Gel as a bubble bath as it foams rather well and should you wish even a shampoo - depending on how dry your hair is. This sounds lovely! I think i'll be treating myself. I love Lush shower gels, especially their sweet ones. I really want to try this it sounds like such a gorgeous scent! I've just run out of snow fairy so definitely need to treat myself :) absolutely love the little frog in the photo!! I love Lush products. They smell soooo good, and are so gentle on the skin! Obsessed with Lush at the moment! I have to try this, it sounds great. Ugh that fragrance is right up my alley!! I love those types of scents. I might have to get it! I seriously want to but the whole of the lush shop right now! Sounds amazing, definitely going to have to try it out!